A ribfest (short for rib festival), sometimes called a rib cook-off is a type of food festival that occurs throughout the United States and Canada. The size of each ribfest is often measured by the number of traveling professional "rib teams" which sell food and compete at the events. A rib festival generally has multiple food vendors selling barbecue beef or pork ribs, pulled pork sandwiches, chicken, coleslaw, baked beans, and other related food choices. The vendors usually compete against one another for top spot in several categories including: Best Ribs, Best Sauce, Best Pulled Pork, and the Peoples Choice Award. 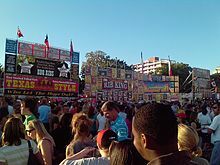 The rib festivals often coincide with music festivals, such as the "Dallas Ribfest Gospel BBQ", or Cleveland's "Great American Rib Cook off & music festival". ^ Benedetto, Richard Chautauqua Rib-Fest Kicks Off In Celoron Today Archived 2010-09-13 at the Wayback Machine. June 9th, 2010. Wikimedia Commons has media related to Ribfests. This page was last edited on 16 April 2018, at 17:57 (UTC).